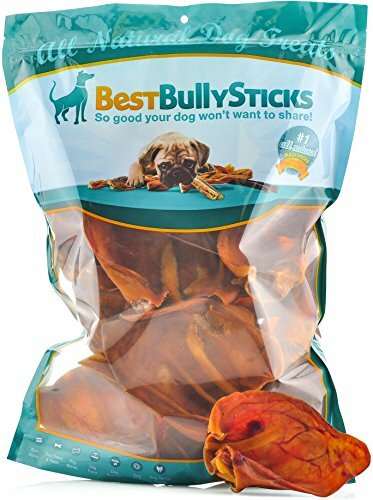 Best Bully Sticks is committed to providing healthy, all natural treats with the real meaty taste dogs desire. Our 100% Natural USA Pig Ear Dog Treats are single ingredient and fully digestible unlike other highly processed rawhide products. Made right here in America, these chews are packed with protein and free of any additives to ensure your pups are getting the nutrients they deserve. Our Pig Ears are also uncut and slow cooked to lock in all of the savory pork juices dogs love. Reward your pooch with 100% Natural USA Pig Ear Dog Treats and keep them happy and healthy! 100% Natural Pig Ears: Authentic Pork Taste that Dogs Crave! If you have any questions about this product by Best Bully Sticks, contact us by completing and submitting the form below. If you are looking for a specif part number, please include it with your message.